I’ve had this incredible desire to knit, which I’ve only done a teeny bit of. Mostly I crochet. My first project was a beanie, on the round. It wasn’t as scary as I thought it would be. You Tube helped a whole bunch. First I watched this, then I accidentally dropped a stitch and found this. Thank goodness! I thought all was lost. I am half way through my second beanie now. This entry was posted in Food, recipes, Knitting/Crochet. Bookmark the permalink. oooo, that popcorn makes my mouth water! what would we do these days without our online video tutorials! the hat looks great. The hat is adorable and the popcorn looks delicious! I’ll have to try that! That is an awesome hat and for just a wee bit of experience… incredible Regina. The popcorn looks yummy!! Your new banner is very cute! Oh, that was a great tut on how to fix it. I wonder if I can do the same when using a knifty knitter. 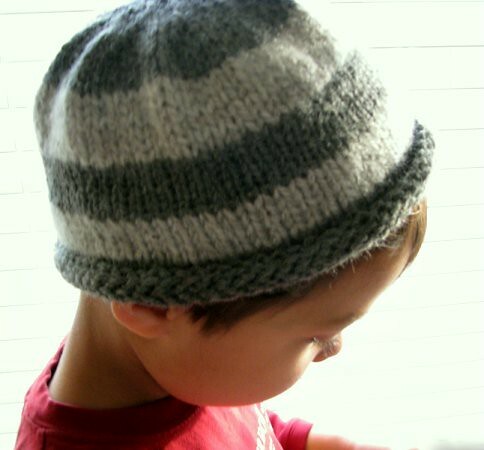 You did an awesome job with your first knit hat. 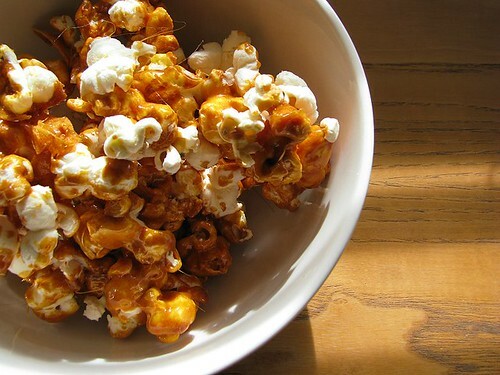 Popcorn looks delicious btw. Thank you so much for the links to the tutorials. I guess I’m not very computer literate. I had no idea I could find things like that on youtube! I’ve wanted to learn to knit for some time, but don’t live near a knitting store and all of my friends who knit are at least an hour away. Now, I know where to start looking. Love your hat. The stripes are great. The popcorn has made me hungry. Looks yummy.